The Fayette County Humane Society visited Jeffersonville Branch Library recently. Brad Adams, humane agent and outreach education director, talked about the humane treatment of animals and dog bite prevention safety, Those attending were (pictured left to right) Nick Marando, humane agent; Jaden, Jordyn, Annabel, Sam and Brad Adams, humane agent. https://www.recordherald.com/wp-content/uploads/sites/27/2018/06/web1_humane-society-visits-library.jpgThe Fayette County Humane Society visited Jeffersonville Branch Library recently. 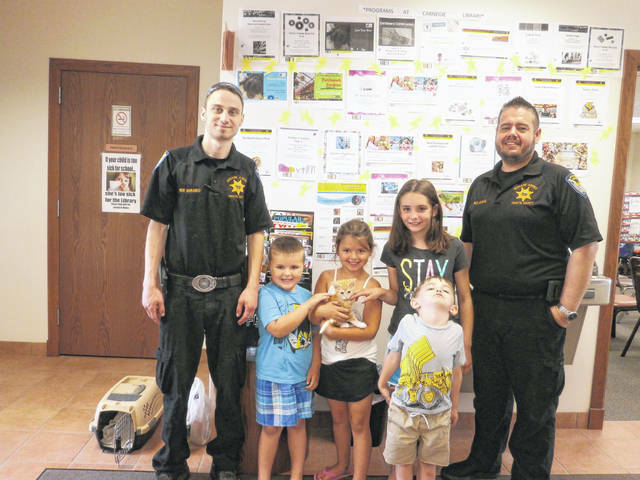 Brad Adams, humane agent and outreach education director, talked about the humane treatment of animals and dog bite prevention safety, Those attending were (pictured left to right) Nick Marando, humane agent; Jaden, Jordyn, Annabel, Sam and Brad Adams, humane agent.